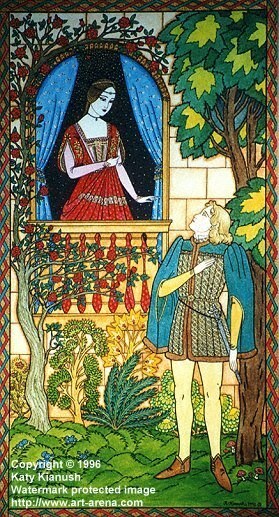 Based on Shakespeare's play "Romeo & Juliet"; a stylised painting with bright and luminous colours, resembling stained glass. The scene is one of the most famous in the play (Act 2, Scene 2): "...But soft! what light through yonder window breaks..."